Land Rover got it all wrong when it turned the Defender into a movie star last year. Thereís a maxim that says if your career is flagging, die, and the chances are things will improve. 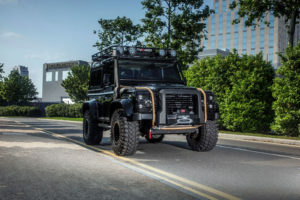 Somehow this got lost in translation, and with interest in the Defender at an all-time high as it was about to be killed off, Land Rover decided to give it one of the most high-profile movie gigs imaginable ñ a starring role in the latest James Bond flick. Predictably, interest in the model went stratospheric and innumerable replicas were created in a desire to cash in on that magical film screen connection. One of the companies keen to get in on the Bond action is Tweaked Automotive, a division of Super Tweaks. While the latter offers parts and accessories for a wide range of marques and vehicles, Tweaked was set up to focus exclusively on the Defender, for which it offers bespoke vehicle conversion packages and customisation, as well as the sale of new and used modified vehicles. The companyís Jonathan Webb comments: ìWe founded Tweaked Automotive in response to growing demand for unique versions of the Defender. 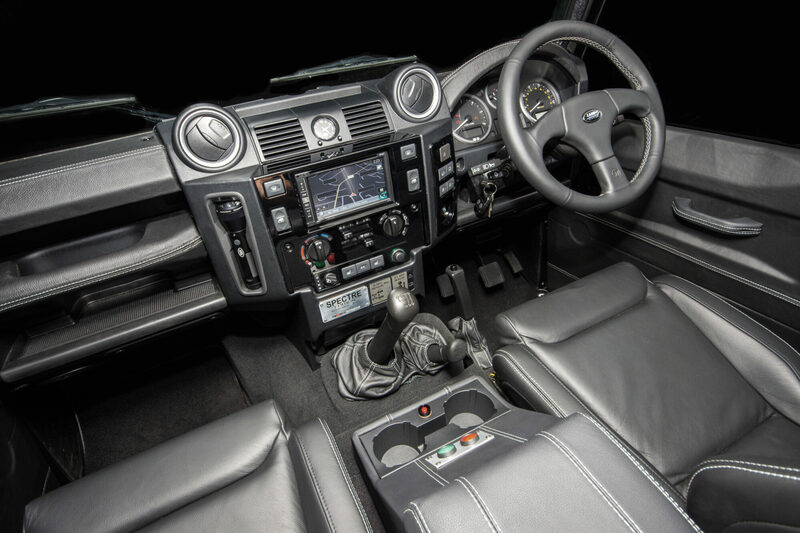 One of the most iconic vehicle designs in the world, the Defender, has long been the vehicle of choice for a range of people and organisations around the globe. With the last example rolling off the production line at the end of January 2016, after 68 years, we believe that the importance of the Defender will not die away any time soon. The beauty of the iconic Land Rover is that it can be anything it wants, from an urban city car, to an adventurer, to a full-on off-roader. Itís a truly dynamic vehicle that sets itself apart from the restî. Webb continues: ìWith the Defender about to bow out of production, we wanted to create something really special. Its inclusion in Spectre gave us the perfect opportunity to build our own take on the theme ñ something that would be ours, but still universally recognisedî. While people talk about ëthe Spectre Defenderí, there were actually no fewer than 10 supplied by Jaguar Land Roverís Special Vehicle Operations division for weeks of punishing filming. Each one was based on a Defender SVX 110 pick-up, with an engine uprated to produce 180bhp; a 50 per cent increase on the standard carís 120bhp. Each of the 10 Defenders supplied was fitted with 37-inch tyres, raised suspension, a quicker steering rack to improve agility, a roll cage on the outside of the car and modified wheel arches to allow a greater range of suspension travel. There were further mechanical changes too; the front and rear differentials were strengthened to cope with the extra torque, and they also featured lower ratios to increase acceleration for all of the stunt work they had to undertake. While the mechanical upgrades were essential for the stunt driving, it was the carís look that made it so appealing to the fashionistas who would go on to covet the Spectre Defender. A big part of the look was provided by the raised suspension and over-sized wheels, but it was the details that really set things off. The rope around the grille, the winch, the side steps and black paint ñ plus those spot lights across the leading edge of the roof. By using as many of these styling cues as possible, a wide array of Spectre-inspired Defenders have been built, but few have been based on the pick-up ñ most use the regular 90 or 110 bodyshell instead. Tweaked chose the short-wheelbase option, largely because nobody else had done so ñ the 110 has proved much more popular with these conversions. Webb continues: ìAs soon as a black Defender 90 station wagon donor vehicle was allocated to the project, we started gathering the right external components, such as the beadlock wheels, tyres, extra-wide wheel arches, roof rack and front roll cage, along with the custom-made front bumper. We also had to source a suitable winch, snorkel, spot lights, North American Spec rear bumper, spare wheel carrier, and many more parts, from headlights to the same recovery/tow rope used in the film. The external parts were true to the ones used by Special Vehicle Operations on the original design; it was very important for us to make this as authentic as possible and use the highest quality components availableî. Predictably, it wasnít just a question of buying a bunch of bits and bolting them all on to a standard Defender. Webb adds: ìQuite a bit of custom work and fabrication was required to get certain components to fit together, such as the roll cage and fixed snorkel. The bumper was custom made to mimic the bumper used in the film, with the raised sides. Because of the Defenderís construction, fitting some parts is very involved ñ many new cars are designed and built in such a way that fitting replacement or aftermarket parts isnít difficult or time consuming. Thatís not the case for the Defender though, even though itís a car thatís frequently modified. In the end it took us eight weeks to find the parts and create the car, with the beadlock wheels and unique wheel arches impossible to source, which is why we had them made speciallyî. While the aim was to create a car as close to the original as possible ñ albeit using a 90-inch donor rather than a 110 ñ Tweaked also wanted to build something that was more usable than the film car. After all, Tweaked didnít expect many of its customers to drive flat out down ski slopes while being chased by helicopters with rocket launchers. To that end, the car had to be more comfortable and more driveable too, which is why the 37-inch tyres were ditched in place of 35-inch items ñ a small but significant difference. To keep everything in proportion, the Defender was given a two-inch lift using a suspension kit, and while the suspension was being overhauled, Tweaked also fitted replacement heavy duty radius and steering arms, adjustable panhard rods, an uprated steering damper, and poly bushes to keep everything as sharp as possible. In a bid to ensure this wasnít a car that was all mouth and no trousers, and also to match the genuine Spectre Defenderís specification, a stage three ECU was fitted, while the air filter, exhaust system and intercooler were tweaked to boost peak power to between 185 and 190bhp. At the same time, all this jiggery pokery also increased peak torque to around 360lb ft. Says Webb: ìTorque is increased across the entire rev range, the focus being on mid-range (2,000 to 3,000rpm) thatís most useful in daily driving, allowing you to change up through the gears sooner, keeping the revs down and saving fuel. Peak power is typically up at around 3,500rpm, although this and the torque delivery can be tailored as requiredî. Tweaked didnít overlook the interior either, with things dominated by figure-hugging leather-trimmed seats that wouldnít look out of place in a mid-engined supercar, rather than a hard-core mud-plugging off-roader. Also added to the mix was a smaller leather steering wheel, and a navigation system incorporating cameras front and rear. While the car pictured was the first one to be built by Tweaked, the companyís plan is to build a limited run of similar Land Rovers based on individual requirements. Customers can base their car on a 90 or 110 Defender. Tweaked can provide a suitable car for you, or convert one that you already own. Says Webb: ìWeíve had a lot of interest already, with several kits of parts being shipped to the US, Far East, Middle East and Europe. Weíve also got a few cars booked into our north west London workshop, for us to undertake the work. For the full Spectre conversion we charge £34,200, while itís £36,000 for a 110. However, we offer bespoke cars, so if an owner wants an interior thatís extra-special, they only have to tell us what they want and we can do itî. The Tweaked Spectre Defender made its debut at the Land Rover Owner International Show in September; if you missed it there, your next chance is at the Great British Land Rover Show at Stoneleigh Park on 27th November. Or you could just skip this one and wait for the next Tweaked Defender special.